It would take you not living in the place where you grew up — far from the daily tastes, smells, sounds you love — to truly understand the joy I get when I discover Cuban/Miami-home-style food and products in Nashville’s grocery stores. In the morning, I ran into Publix to grab some coffee creamer and cut through the frozen food aisle. I always look in the “Hispanic foods” section for fun. 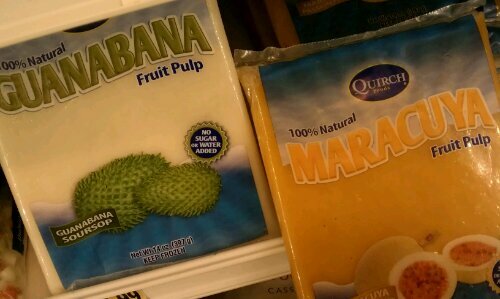 And there it was: Frozen guanabana pulp! (Passion fruit too, but I’m more a guanabana girl…) Dreams of guanabana shakes on hot summer days! Hurrah, a taste of home in the new homeland. Then, the same day, in the evening on my way home from work (Yes, I’ll tell you about that soon…) I dropped into the little store in my tiny town and saw the word “Manteca” out the corner of my eye. Manteca! 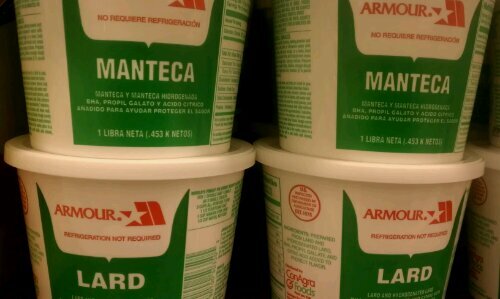 Yes, I rejoiced at seeing lard, but mainly because it was written in Spanish and found in the most un-Spanish of places. The last time I did a Wepa dance in a store aisle, I found dulce de leche in a squeeze bottle. You would have thought I had just seen a naked George Clooney, I was so happy. And again, if you don’t live far from your gente, you have no idea what I’m talking about. That’s OK…I am solid in my crazy, and in my longing for frozen tropical fruit pulps. We call passion fruit parcha, but yay for Latino products in the grocery store!! !